Along the coastline of North Weymouth there are two main beaches – Wessagusset Beach and George Lane Beach – better known by Weymouth residents as the “old beach” and the “new beach”. Lane Beach on River Street features a large parking lot for residents and non-residents, restrooms from May to October, and a public boat ramp. Weymouth Recreation Department offers numerous programs throughout the summer at Lane Beach. (A parking permit at Lane Beach is required from May to October). Two yacht clubs make their home in North Weymouth waters – South Shore Yacht Club on Back River and Wessagussett Yacht Club on Fore River. Wessagussett Yacht Club offers memberships for non-boat owners as well as boat owners. Just east of Lane Beach on Weymouth Neck is Webb Memorial State Park, one of the jewels of the Boston Harbor Islands National and State Parks. 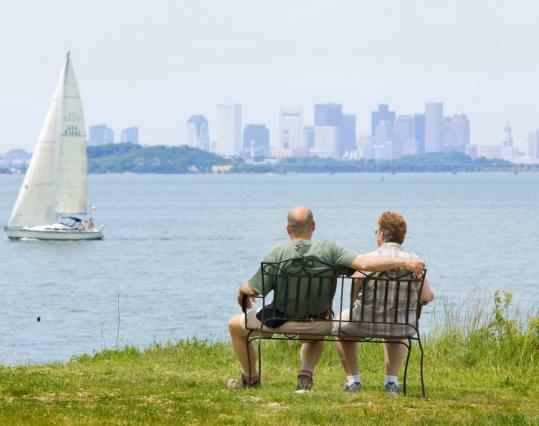 The 36-acre park, popular among walkers and ocean lovers, is on a peninsula extending half a mile into the Hingham Bay portion of Boston Harbor, and offers unparalleled views of the Boston skyline and harbor. Weymouth’s Grape Island is visible from the park and is one of the only Harbor Islands National Park Area islands on which camping is permitted. Great Hill Park and Great Esker Park also stand out as distinctive green spaces, both along North Weymouth’s waterfront. 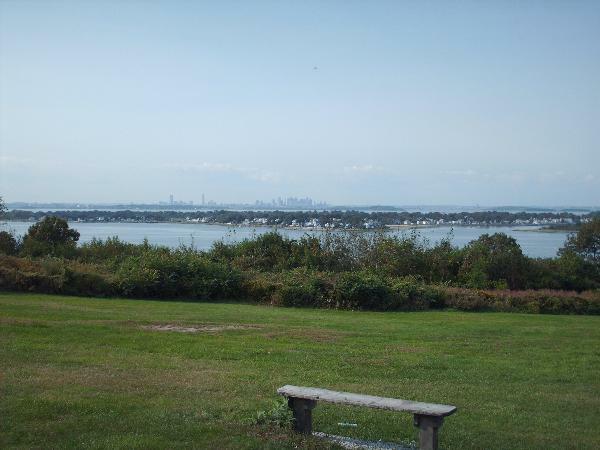 Great Hill Park has a 140-foot elevation and offers sweeping views of the Boston skyline and the entire scope of the harbor to the North Shore. Great Esker Park is home to the largest esker (a glacially-created geological formation) in North America, and has six miles of walking and hiking trails along quiet marshland and hilly eskers. It runs alongside the Weymouth Back River, which is known for its fishing, kayaking, and bird-watching. A second waterfront park, Abigail Adams State Park, is located just before crossing the Back River Bridge into Hingham. Two other wonderful parks in North Weymouth are Beals Park (between Bridge and Sea Streets) which offers a playground, walking paths, a basketball court, and sledding hills, and James T. O’Sullivan Park (on Pilgrim Road across from Wessagusset Elementary School) which has three ball fields, a playground, a basketball court, and seasonal concessions.